Welcome to BIREI Kimono & Culture! 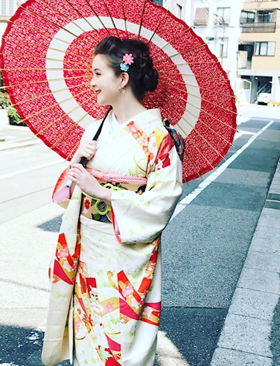 ASAKUSA TOKYO, BIREI Kimono & Culture! Let’s take the air dressing beautiful kimono that reflects a sense of the season. As we know, we have beautiful four seasons in Japan. We would like you to feel how comfortable to wear Kimono in rhythm with the seasons. "We made a last minute reservation with them one day before one of the most popular summer festival in Tokyo. It was great that Maiko was able to squeeze a time slot for us despite her busy schedule. She is a very nice lady and even allowed us to reserved our desired yutaka (as our time slot was very late). Very fluent in English. Location is easily located and a few minutes walk from Asakusa. Very affordable and most of their yutaka looks good. Couldn't recommend more!! (Google comment)"
Kimono one day rental +rickshaw 30min!! Your reservation can be made under the condition: from 12:00〜, more than 2 people. Total weight should be less than 200kg. 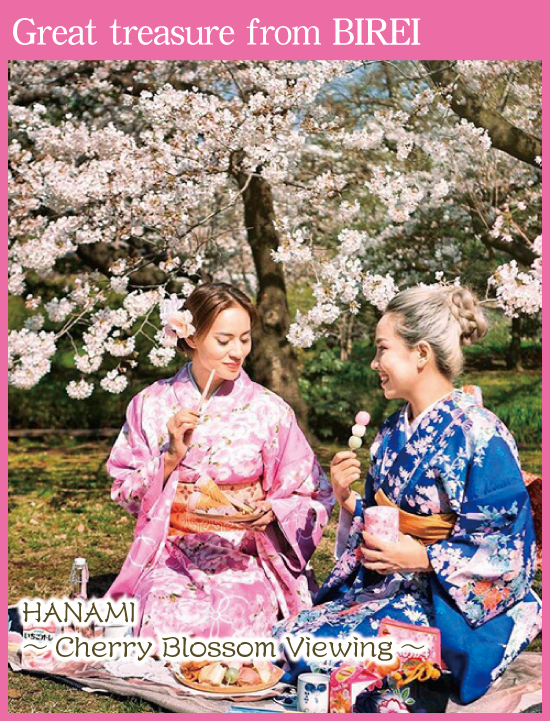 After you wear kimono, your rickshaw will pick you up to Sumida riverside, nice view spots you can see Skytree, special spots you can take photos with cherry blossoms, and reach to Sensoji temple. Unbelievably reasonable and high quality! Cherry blossoms viewing has been a unique custom in Japan. The period of blooming of Sakura is only 1-2 weeks, but that’s exactly why it tells us the ephemeral life is so beautiful. 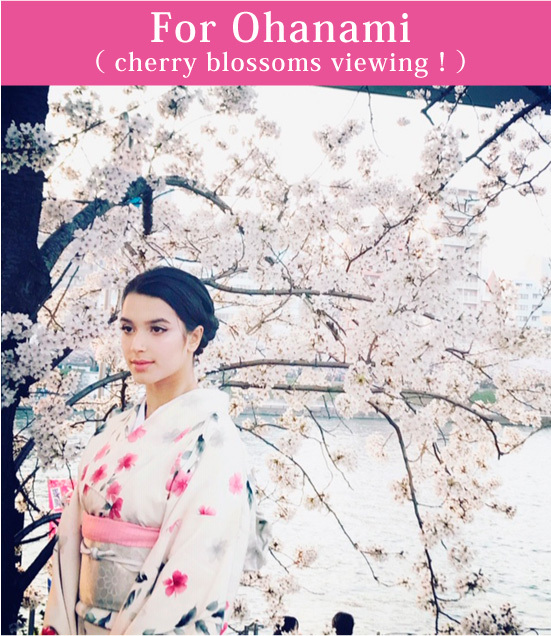 To feel true beauty of this blooming season, let’s wear real and beautiful kimonos of BIREI! 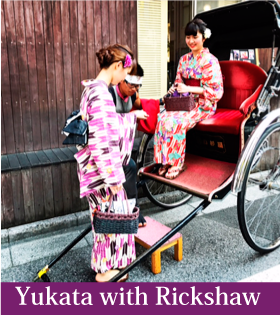 Jinrikisha (rickshaw) and photo-shooting are greatly recommended options!!! After completed dressing Kimono, you can take a walk around and have fun for sightseeing Asakusa for 2 hours. We would like to recommend some good places to see and eat that only locals know! After completed dressing Kimono, you can spend your valuable time with Kimono until 16:30. For example, you could enjoy a vaudeville show, called YOSE in Asakusa, or take a train to Ginza to see KABUKI if you want!! For formal occasions, such as wedding party, special lunch/dinner at hotel, and New Year, you can wear formal kimonos. There are some types of formal kimono in Japan. 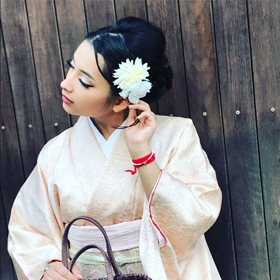 Furisode: The most formal kimono for young unmarried ladies. Houmongi/Tukesage: Formal kimonos for married ladies. Tomesode: The most formal kimono for mothers of Bride at wedding. 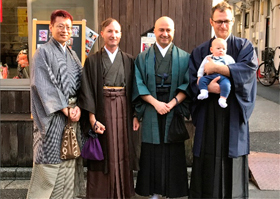 If mens wear Kimono with Hakama, it will be much formal to attend wedding party as a guest. Special Photo shooting plan by BIREI !!! This is an option you can select when you have kimono plan! We will use your camera or our iphone to take photo shooting. Since our manager (Okami) will be with you, you do not have to worry about losing its shape! 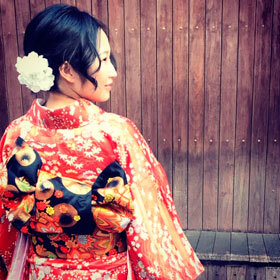 Okami will teach you how to move, nice poses with kimono, and beautiful spots to take photos. Also, she will talk about the histories of Asakusa, and tips to walking around the town. So, she will not be only your photographer, but also your concierge! You can use Japanese umbrellas for your photo shooting! After your photo shooting finished, you will have free time and come back to our store by 17:00! We will go to Komagata bridge and Komagata-dou temple, where people will take wedding photos!! About 60 photos will be taken and you will receive all the data when you come back. We will go to Komagata bridge, Komagata-dou temple, and Kaminarimon gate, Nakamise street, and Sensoji temple! About 100 photos will be taken and you will receive all the data when you come back! You will ride Rickshaw (15min), and go to kaminarimon,Nakamise street, Sensoji, and Sumida river park. About 130 photos will be taken and you will receive all the data when you come back! Best offer from BIREI Okami recommend! You will have a beautiful kimono, and Rickshaw will pick you up and go to Kaminarimon gate (15min). After the rickshaw, we will take photos around Kaminarimon gate, Nakamise-street, and Sensoji temple!! 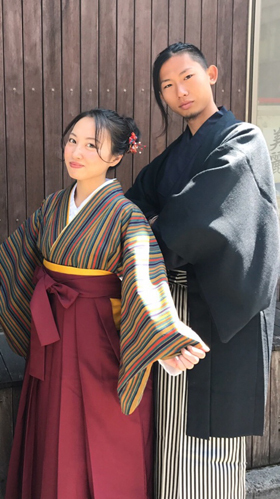 Hakama is one of the traditional wearing for male, as you see below. It is put on Kimono and can be used for formal scenes, such as tea ceremonies, graduation, and wedding. If you see Japanese samurai movies, you will find they wear Hakama very cool! you can move easily than normal kimono since it is like skirt or pants. Let's feel Samurai spirit with Hakama! We have also Hakama for ladies!! It is knows as a formal wearing such as graduation, but you can also wear daily. Since Hakama used to be a uniform for young girl students, you will find you can move easy and can be active with hakama! Hakama is available from Oct to May! If you have any questions, feel free to contact us!! 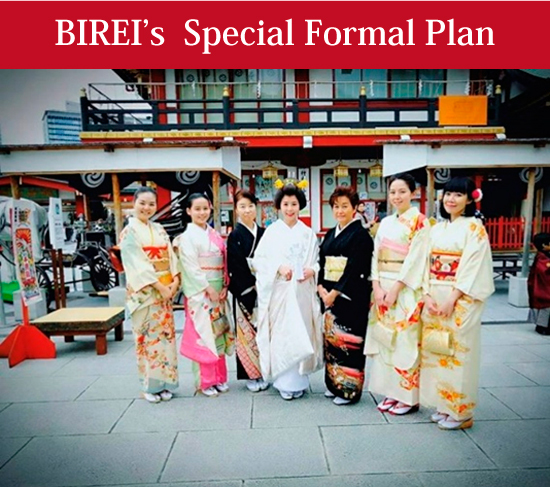 After dressing Kimono, JINRIKISHA KOSUGIYA, one of the most professional JINRIKISHA people will pick you up at BIREI. They will take you to a wonderful trip rom Sky tree to KAMINARIMON (takes about 15min). Enjoy our beautiful silk kimonos for New year greeting! All items, furs, kimono outfits are free to rent!! 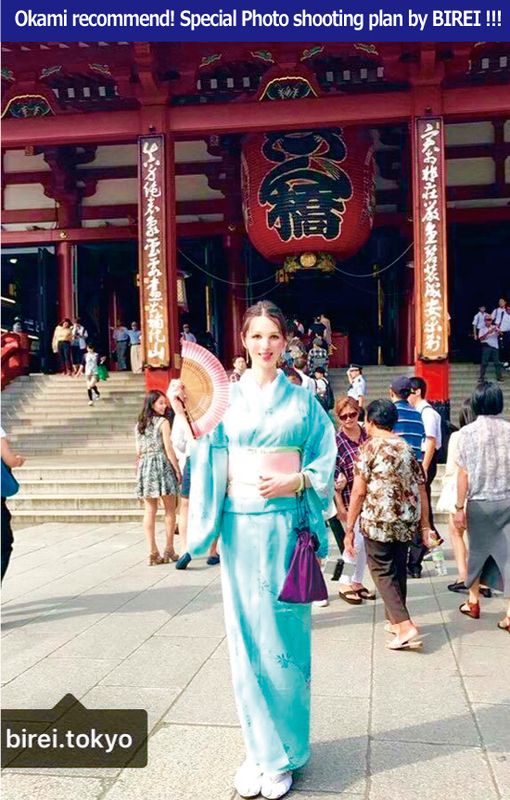 Not just trial kimonos for tourists but we offers traditional way of dressing with graceful kimonos. How to wear is very important when you go out in kimono. Every details, such as length, tightness, figures of your fittings. We will dress you with our professional skills and experiences. 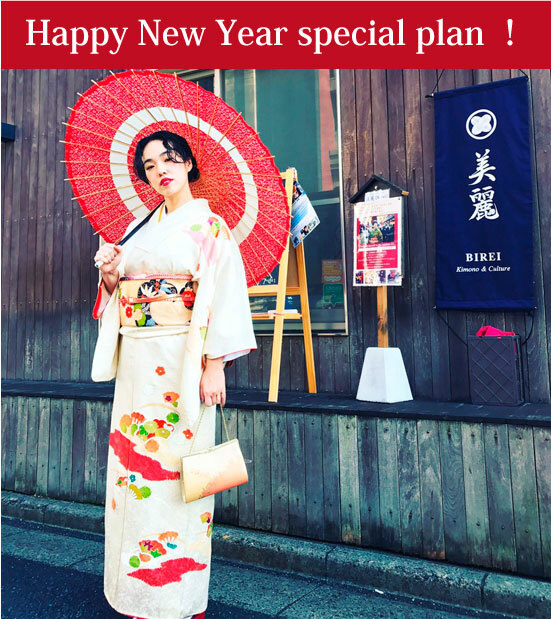 In this plan, you will get a special present as new year gift from us !!!! 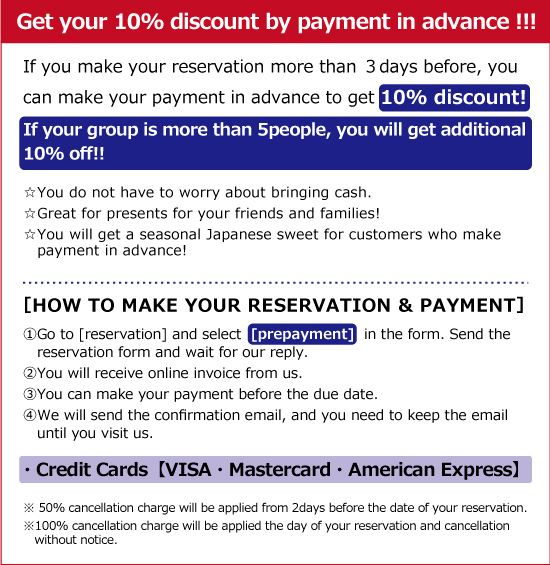 This special course will be offered from 1/1～1/15！！Reservation can be made with more than group of 2 people. 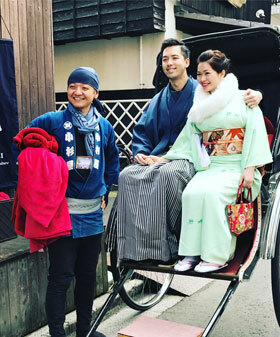 Gorgeous Kimonos ＋rickshaw ride will make you feel such a great new year holiday in Japan!! You can rent your kimono until 17:00, and your rickshaw will pick you up, take you to Ushijima Shrine ( one of the famous shrines in Asakusa area) where you can enjoy beautiful Japanese garden. Rickshaw drivers can take your pictures nicely and tell you how to greeting/praying to the shrine properly. Finally you will reach to Kaminarimon Gate. Free warm pads, sweet sake, hot tea!! Kimono jackets, furs are free to rent!! we will send your invoice via email so that you can pay it online. 50%cancellation fee will be applied from 3days before your reservation date. 100% from one day before. (Main Plan + 2000 Yen / If you try only ORIGMI, it will be 3000 Yen). 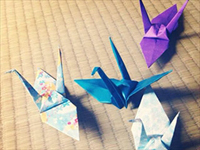 Cranes and seasonal flowers you will fold could be a great souvenirs for your friends and family!! 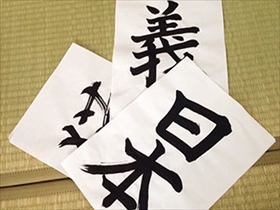 ( Main Plan + 2000 Yen / If you try only Calligraphy, it will be 3000 Yen). You can choose some characters or words you prefer to write. Rapped nicely to take your home with you!! We have Kimonos for Kids!! Main Plan : Same prices as Adult’s. SHICHIGOSAN (The Seven-Five-Three Festival ) Plan : 7530 Yen / person Dress-up Kimono, Nice photo with a frame, and candies for celebration of SHICHIGOSAN, festival for 3-year-old boys and girls, 5-year-old boys and 7-year-old girls. Normally Shichigosan festival is held in November. We celebrate our children’s good healthy long life and hope their good lucks in the future. ※ You can buy TABI Socks you use for 500 Yen. The Price includes tax, hair accessories, summer underwear, yukata shoes, and etc. Nothing should be prepared in advance. Also, we offer all types of yukata with same price! No ranking differences. Summer kimonos, called YUKATA is ready for you! We will be ready to offer our Yukata plan from May 1st. Even though it seems a bit early for yukata as kimono schedule, if it's so hot, you can wear yukata instead of kimono. We can arrange yukata dressing like Kimono too. Yukata is a casual summer wearing in Japan, and very popular and comfortable like a summer dress. So people in Japan often wear Yukata for summer night, fireworks festivals, and Bon dancing party! Compared with Kimono, Yukata is very casual and easy to wear because of less layers. However, it would be really difficult to dress beautifully, and securely. So, we carefully pay attention to the lines and figures to make your yukata style perfect! Also, our Obi belt arrangements are the must-see! We are not using easily generated obi belt, but arranged to make great figures with long obi-belts by hands. It will be beautifully arranged on your backside. BIREI's YUKATA is the BEST!! 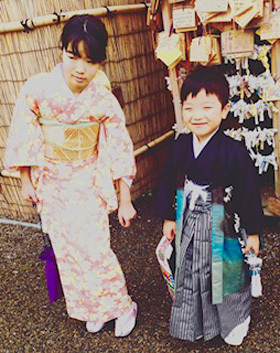 We selected our yukatas with holding to our uncompromising standards! Some are all hand-sowing, traditionally dyed with indigo and the deep blue is indescribably beautiful. Cool, beauty, elegant, cute, modern, antique...!!! Any style you want ! You can be what you want to be with our yukata! 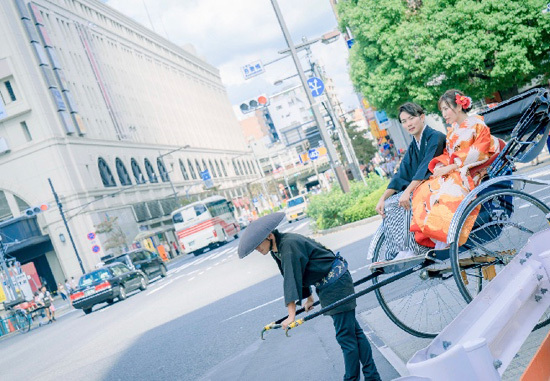 After dressing kimono, your Jinrikisha will pick you up from our place to Kaminarimon gate (15min). Please kindly call or email us before you visit our store to make sure your time slot available.